On July 3, 2017, Pittsburgh Mercy launched the first and only federally Certified Community Behavioral Health Clinic (CCBHC) in Southwestern Pennsylvania. The new federally funded, two-year demonstration project is part of a comprehensive, national effort to integrate behavioral and physical health care, increase the consistent use of evidence-based practices, and improve access to high-quality, community-based, behavioral health services for persons with mental health and substance use disorders (also known as addictions) and other vulnerable populations. The highly coveted CCBHC demonstration grant aims to show that high-quality, innovative behavioral health care services can achieve specific, measurable outcomes, including decreasing health care costs by reducing emergency department visits and hospital stays for behavioral health reasons. CCBHCs are made possible through Section 223 of the Protecting Access to Medicare Act of 2014 (PAMA) and were defined for the first time in the federal Excellence in Mental Health Act of 2014. Health and human service providers that applied were audited for quality and innovation standards prior to selection. Only providers with the highest scores were awarded CCBHC status. Pennsylvania awarded CCBHC designation to Pittsburgh Mercy in December 2016. The person-centered, population-based, trauma-informed health and human service provider is one of only eight locations in the state – and the only one in Southwestern Pennsylvania – selected to participate in the CCBHC pilot. What’s a Certified Community Behavioral Health Clinic (CCBHC)? Improve access to high quality, community-based, behavioral health services for persons with mental health and substance use disorders (addictions). Through our CCBHC, you’ll have greater access to mental health and addiction services as well as many opportunities to continue to stay engaged between scheduled appointments and throughout your recovery journey. The CCBHC was developed on the principles of excellence in mental health care. The awarding of the CCBHC demonstration project to Pittsburgh Mercy further validates our staff’s dedication, ability, and commitment to provide innovative care to persons who are most vulnerable. This demonstration program is also a tremendous opportunity to enhance our journey as a person-centered, population-based, and trauma-informed center of excellence. Improve our ability to achieve the triple aim: better care, healthier people, and lower costs. How does the CCBHC affect my services? Provide the necessary treatment for those with the most serious, complex mental illnesses and addictions. Ensure a person-centered approach to care that emphasizes a welcoming environment, recovery, wellness, trauma-informed care, and the integration of physical and behavioral health care. What services does Pittsburgh Mercy’s CCBHC offer? Intensive, community-based mental health care for active armed services members, veterans, and their families. Pittsburgh Mercy has long provided these and many other innovative services to the community. Who provides services at the CCBHC? Services are delivered by compassionate, dedicated, and highly qualified therapists, targeted case managers, care managers, physicians, and support staff. Each team is supervised by an experienced practice administrator. Will I have a say in my care? Yes. You’re at the center of everything we do. For information about what you can expect, visit the Your Care page. Will I have a say in my loved one’s care? Yes. Family, friends, and community supports play an important role in the recovery journey. There are multiple opportunities for family support and participation. Please ask your (or your loved one’s) care team for additional information. Do you offer support services for families? Yes. Please ask your care team for additional information. When can I access services? Need help? Please call us at 1-877-637-2924. Services are delivered in several community-based settings and locations. Many of the services we offer can be accessed or delivered to you at home, at school, or elsewhere in the community. No. However, appointments are encouraged. What if I have a specific need? 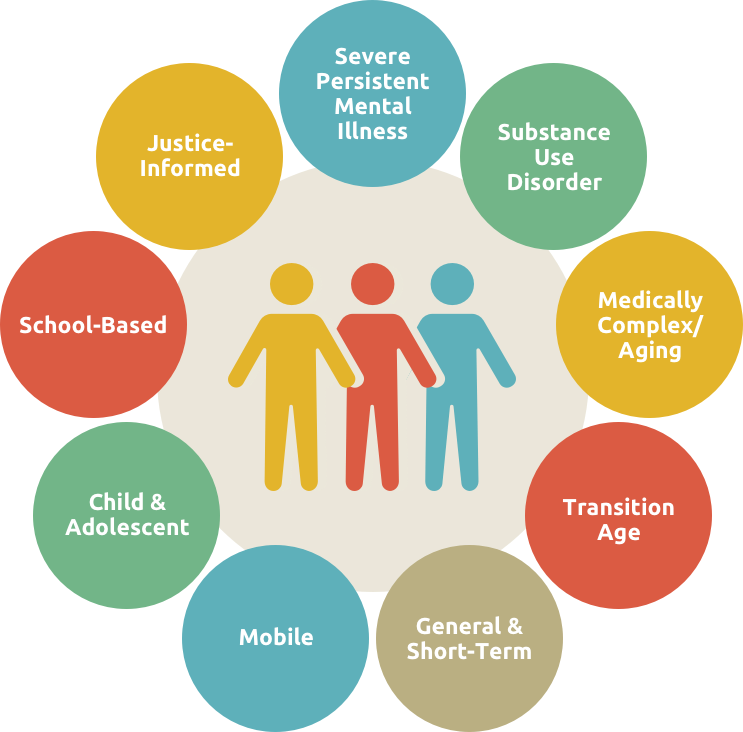 Individuals who access school-based services, justice-related services, mobile outpatient services, and general and short-term services. What if I have multiple or complex needs? Whether you have one specific need or several complex needs, our experienced and caring teams are here to help. Yes. If you have a question or concern about the accessibility of our services, please call 1-877-637-2924. If you need help getting to an appointment, please let us know when you call or come for your appointment. You can bring your child to some appointments. Please ask when you call or come for your appointment. Underserved and low-income individuals and families. Those who are insured, uninsured, or on Medicaid. If you don’t have health insurance, let us know when you call or come for your appointment. We may be able to help connect you to benefits. Yes. Language translation services are available upon request. If you need to access these services, please ask when you call or come for your appointment. View our Notice of Nondiscrimination for details. Do you offer services for people who are deaf, deaf-blind, and hard of hearing? Yes. We offer service to persons who are deaf, deaf-blind, and hard of hearing (i.e., American Sign Language interpreter services, video phone, etc.). If you need to access these services, please ask when you call or come for your appointment. Yes. We can help you to find, get, and keep housing. Can you help me with employment? Yes. We can help you to find, get, and keep employment. Anyone may refer an individual to Pittsburgh Mercy for services. To refer an individual to Pittsburgh Mercy for services, please call us at 1-877-637-2924. How will you ensure the quality of the services you provide? At Pittsburgh Mercy, we want all of the services we offer to be of the highest quality. We’re accountable to you and all of the communities we serve. Quality outcomes for persons served at Pittsburgh Mercy and other participating CCBHC pilot centers will be measured and monitored for two years against national benchmarks. Where can I find more information about what I can expect? For more information about what you can expect, visit the Your Care page. Where can I find more information about Pittsburgh Mercy’s CCBHC? For more information about Pittsburgh Mercy’s CCBHC, please call us at 1-877-637-2924 or send us a message. We’re here to help.